My oldest daughter was diagnosed with Type 1 Diabetes at the age of two. Technology has come a long way in terms of tracking blood sugar levels, but I thought I would start a Python web application to do so. I’ll be using the Flask web framework for the project and, since I’m not a marketing or product naming genius, will call the project Flask Blood Glucose Tracker. I’m certainly open to other, more catchy, names. This is somewhat of a different post for me, in that I’ll be walking through the generation of an actual application. The application will mostly be a minimal viable product (MVP) though. It should, however, be a good tutorial on how to integrate some concepts and technologies together. As such, in this first post, I’ll cover some of the project specifications and features that I’d like to include and work on implementing them in future posts. Diabetics have to check their blood glucose levels frequently, typically using a blood sugar monitor . These checks involve getting a small portion of blood from a finger (or arm) prick and having the monitor test it. It then returns a measurement of the amount of glucose in the blood as a number of milligrams per deciliter (mG/dL). These readings then will be the numbers we want to record in our application. It is also important to know if the reading is taken before or after eating and the time of day the reading was taken. Therefore, the application will need to accommodate for that as well. The readings themselves, along with the time of day and relation to meal time are all factors into the amount of insulin needs to be injected. Throughout this, and subsequent posts, I will do my best to explain diabetes-specific terms in as user-friendly of a way as possible. I am basing much of the numbers that I use, ranges of “good and bad”, etc. on managing my daughter’s diabetes over the last 14 years and the countless doctor appointments I’ve attended. As a disclaimer, I am not a medical professional. Please check with your physician about specifics with diabetes. There is a Diabetes For Dummies book which provides a decent overview as well. Register for the BGT site, with email confirmation. Login/Logout and based on role have different access. Patient to access and edit my own data. Physician to get a list of all current patient records. Input blood sugar levels with date and time of reading and indication of before or after a meal or snack. Display the data in a table with averages. Display the data in a chart or visual format. Data is stored in the cloud for accessibility and ease of database maintenance. For the reporting features highlighting high and low blood sugar levels in the report would be helpful. Since what is “good” and “bad” can change for each individual, I’ll include a field for each individual to set that. I have already mentioned that this application will be built with Flask. For the data store, I will use MongoDB. To keep in line with the feature request of storing data in the cloud, MongoDB offers a Database as a Service (DBaaS) called Atlas. I haven’t quite figured out yet where I’ll ultimately host this application, perhaps Heroku? Or maybe on my own server. When it comes to libraries, there are a lot of choices. Here’s what I’ll be using, which will also be included in a requirements.txt file. There are other libraries that will but used as well, but those are the main ones of interest. I’m also more of a fan of Zurb Foundation than Twitter Bootstrap, so I’ll be using that for styling. To start with we need a way for a user to log in, enter their personal data, enter a new blood sugar record, edit their record, and view their information in both a tabular format and then in a chart format. We’ll need the following pages, at least to start. Have the ability to manage users (patients & physicians) but not be able to see patient medical data. 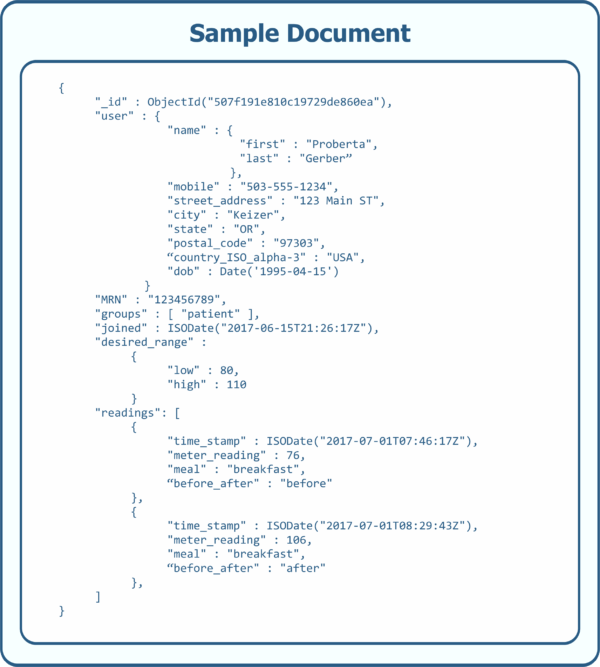 From the API I want to expose the ability to securely read and write (GET and POST) data to a patient’s record. This will make it easier to, for example, write a mobile application to connect to our data. Or, with the advances in blood sugar monitors, perhaps automatically update our application with readings from a device. Since I will be using MongoDB to store data for this application, I’ll be leveraging the document model. This offers a lot of flexibility in how data is stored, among other benefits. I would encourage you to read my blog post on the document model if you are not familiar with it. In looking at this sample document, the groups field will keep track of values such as patient, physician, and admin. I have chosen to implement the postal_code and MRN values as strings instead of integers to accommodate alpha-numeric values. Through the course of developing this application, we will see the flexibility of the document model in action. We’ll see how we can utilize some of the features from MongoDB’s aggregation pipeline to handle our data processing as well. I have outlined a nice project here which will utilize several different bits of programming. In the next few posts then, I’ll cover how to implement all of these features into an MVP application. I would definitely enjoy receiving feedback, so please leave comments below.